Using the latest version of the SmartShop app, customers can use their smartphones to scan their shopping as they go and then pay for it through the app, from anywhere in the store, using Apple Pay. 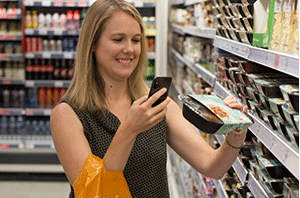 Customers can already use SmartShop in 68 Sainsbury’s supermarkets but the retailer said the trial in Clapham will take this technology ‘to the next level’. It explained: ‘Instead of paying for your shopping at a designated till point, Clapham customers can pay for their basket even faster and from anywhere in the store. ‘SmartShop is growing in popularity with Sainsbury’s customers. There are over 100,000 SmartShop transactions and between 3,000 and 4,000 new customer registrations every week. Sainsbury’s group chief digital officer Clodagh Moriarty said: “Technology and changing customer shopping habits have transformed the way people buy their groceries. “Our teams are constantly working hard to bring new convenient shopping experiences to customers and we’re delighted to be the first grocery retailer in the UK to offer customers the ability to shop checkout-free.